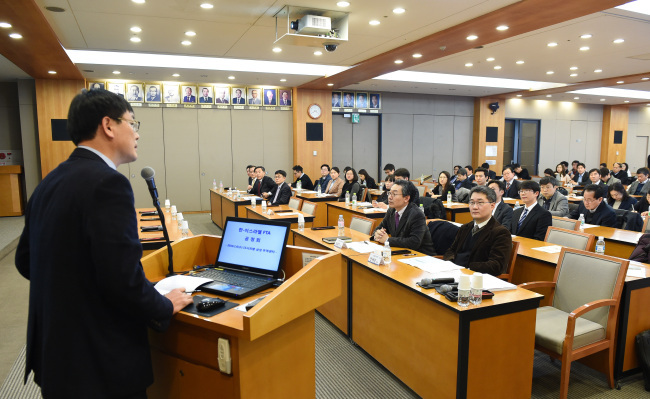 The South Korean government hosted a public meeting in Seoul on Wednesday to discuss the potential benefits and economic impact of a free trade agreement with Israel. Led by the Ministry of Trade, Commerce and Economy, the session brought together some 100 government and industry officials and civilians to examine the FTA’s predicted effects on the national economy. “Now is the right time to actively examine the possibility of a free trade pact with Israel, as the government seeks to boost its exports strategically with expanded FTAs,” said Lee Min-chul, a Trade Ministry representative. Korea’s main exports to Israel include automobile parts and consumer electronics, while equipment used in manufacturing semiconductors takes up the majority of Korea’s imports from Israel, the ministry said. If signed, the Korea-Israel FTA would boost Korea’s total gross domestic product by between 0.007 to 0.061 percent and increase consumer welfare by between $83 million and $720 million, according to a report by the Korea Institute for International Economic Policy. More specifically, the trade pact would propel the growth of Korean businesses by lifting nontariff barriers, which KIEP eyes as a bigger benefit compared to actual tariff reductions. Korea may also strengthen its agricultural export capabilities by benchmarking the agricultural and food trade policies of Israel, a nation which has successfully overcome environmental challenges, said the Korea Rural Economic Institute. After striking an internal consensus, the Trade Ministry plans to deliver the Korea-Israel FTA case for review by the National Assembly, though when this will be remains undetermined. “Due to the upcoming parliamentary elections (in April), the legislative review process is likely to remain stalled for the time being,” said a Trade Ministry official, citing uncertainty as to when official procedures for a bilateral FTA with Israel would begin.